"Humanizing Therapeutics Discovery & Development"
Our Graduate Research Symposium is an exciting, comprehensive event that showcases the high quality, multidisciplinary research conducted in our department, and spans diverse areas such as molecular engineering of novel materials, nanotechnology, bioengineering, and molecular modeling. 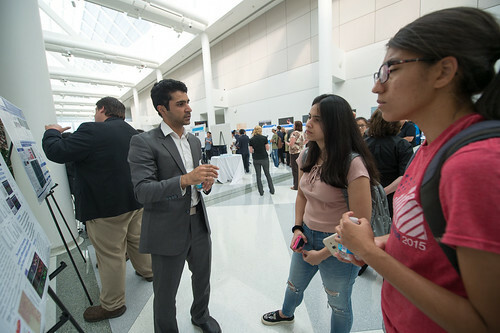 The symposium features over 60 posters, two lectures from senior graduate students, a keynote lecture from an accomplished colleague, and includes a wine, beer, and hors d'oeuvres reception to honor our alumni and guests. All graduate students in their second year and beyond participate in the annual fall symposium. Poster judges from every aspect of chemical and biological engineering come to participate. The event includes a keynote speaker, student lectures, and a post-event reception. 2013: Michael D. Reily, Bristol-Myers Squibb Co.